Ema has two separate issues, the main of which is she has severe pulmonary stenosis. “Stenosis” is a fancy way of saying she has a constricted opening (think “stenotic nares”). In this case, the constriction is impeding her blood flow into her heart. So, she gets excited, her heart pounds, and she faints. The second issue is that she has an atrial septal defect, which is a fancy way of saying she has a hole in the septum diving the two sections of her heart. This is what is causing her to be cyanotic almost all of the time, except for when she’s asleep. Ema is, in essence, a “Blue Baby” (although I suppose “Blue Puppy” would be more accurate). In Ema’s case, her pulmonary stenosis is making her septal defect much more dangerous. Her heart pounds because of the stenosis, the pressure builds, and the non oxygenated blood spills through the shunt into the other chamber of her heart, mixing with the oxygenated blood, and flowing through her body. Since the blood isn’t properly oxygenated, she’s blue. When she’s asleep, her heart slows, the pressure lessens, and the blood does not spill across the shunt. This is what we hope the surgery can accomplish – by opening the stenosis, her heart will be better able to function, and the effects of the shunt (which might get smaller with time) can be lessened. Her heart will never be ‘normal’ – the surgery can’t ‘fix’ her – but it can give her something much closer to normality, and a life span that can be measured in years, rather than the months she has now. As she grows, the strain on her heart grows as well, and her life span lessens. Without surgery, she has months, maybe. With the surgery, we hope she’ll have years. She will never have a fully normal life. She will always need to live in a calm environment, and avoid excessive strenuous activity. There is no agility in her future, but perhaps there can be a lifetime as someone’s beloved pet and companion. For most Frenchies, I think that can be enough, don’t you? I hope so, at least. Dr. Minors, who diagnosed Ema (and who waived her entire consultation fee to do so), is trying to get us a spot for her surgery as soon as possible – within the week, because she’s not sure that Ema has much more time than that. I basically have to sit and wait for the phone to ring, and get there when they tell me they can fit us in. It’s s simple procedure, actually – they’ll go in through her neck, and enlarge the stenosis using something like a balloon. The wonders of modern technology – ironic, really, because when my family vet first said she was sure it was a heart condition, I’d said “Well, then they can’t do anything, can they? It’s not like they do open heart surgery on dogs”. Turns out that I was wrong – they DO do open heart surgery on dogs, or something like it, at any rate. I have debated the merits of doing a $3,000+ surgery on a little tiny rescued Frenchie, of no known pedigree and from heaven only knows where. Practicality says that spending that kind of money on one little dog is a ‘waste’, when it could, theoretically, help 6 dogs who need $500 surgeries. I would say, in our favor, that time spent with Ema will quite quickly convince you that $3,000 is a reasonable price to pay to save her life. She is a winsome, loving, sweet little creature, who desperately wants to make one person the center of her world. She loves her people with a fierceness that can make you throw all of the practical reasons for not spending $3,000 on one surgery out of the window, especially in a world where you can just as easily spend $3,000 on a single purse or pair of shoes. Ema’s diagnostics have cost about $850 so far, and we’ve raised about $2,000, which means so far we have $1,200 or so to contribute to her surgery. I’m hopeful we can raise the rest before she goes in, but French Bulldog Village has kindly agreed to pay the difference, if we can’t. Ema is a joint rescue between Eastern Canada French Bulldog Rescue, and the French Bulldog Village (which has made rather a career out of helping the misfit Frenchies of the world). 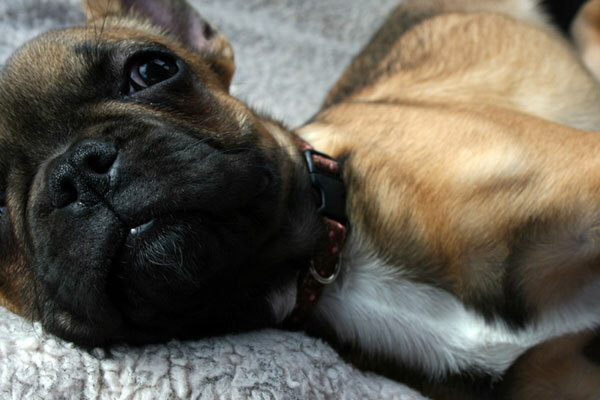 “Our ten year old daughter reads your blog because she has been asking us for a French Bulldog for over a year. We’ve said not yet so she reads about your puppies. When she read about Ema she asked me to send you the $25 she got for her birthday money because she says that everyone needs someone to love them. We hope little Ema gets better soon”. If you can’t afford to donate to Ema’s care, please do the next best thing, by helping us to spread the word. Share her story on Facebook, on Twitter, or on your blog. I know she’s just one little dog, and, worse still, she’s one little dog that most of you haven’t even met yet. However, to paraphrase an old saying – you can’t change the whole world, but you can change the whole world for Ema. I have added her to my facebook page. I am pulling for you Ema. And for you Carol. I would agree that she can have a nice quality of life as a couch potato. In fact, to many people (me among them), that would be an ideal dog! I only wish I could give much, much more to help Ema, but I know that every little bit helps. Carol, you are a French Bulldog wonder – thanks for giving so much to the breed and being courageous and strong enough to help Frenchy rescues like Ema! I’ve tweeted this & added it to my facebook wall. Good luck Ema! Added to 2 facebook pages. Good luck! Dearest little Ema, I gave what I could, I wish it could be more and wish even harder that this wasn’t needed and you weren’t going through this. But you are loved and in great hands. Your story will be told far and wide in hopes that no other little puppy of any breed, or family, will go through what you have. You are a brave little girl. Posted to Blog-check and double check! Donna and the Gnosticfire Crew. Ema is adorable and has a face that could melt the coldest heart. If we can save her, she has a career in being the spokesdog for why people need to donate to French Bulldog rescue. I posted on FB & Twitter and donated. Please keep us up-to-date on Ema’s progress.